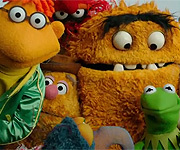 Discussion in 'Classic Muppets' started by punkNpuppets, Oct 14, 2002. WALDORF: What’s all the commotion about? what other ones are there??? Waldorf: Nope; friend of mine, Joe Bravo, he's sitting in the front row. Bravo! Statler: (after putting on his 3-D glasses) Hey, hey look! Look at the guy in the Goofy mask! ...that's not a mask. Oh; sorry lady! Waldorf: Hey look, an orchestra of penguins! Statler: Yeah, probably took the job for the halibut! Waldorf: (commenting on the scenery for Piggy's number) Isn't it lovely? Waldorf: Hey, what's all the commotion about? Statler & Waldorf: Smarter than us! Statler: (on Bean's reuniting with the other Muppets) This is a very moving moment. Waldorf: Yeah; I wish they'd move it to Pittsburgh! I think you might gotten that one reversed... or was that the joke? I think they did that one both ways at differant times. I have got a copy of Manah Manah on my computor and at the end they are chearing and saying how good it is then they change there minds, the same way thay did in the one PunkNmuppets said it only backwards. I think the one where Waldorf tells Statler he doesn't have a life on this planet and also the one where he is calling for Joe Bravo are both from the Dom DeLouise episode. Though, I can't quite remember which ep the Gene Kelly quote came from. Lol. Just kidding. Actually, the Bravo Bravo quote is from the George Burns episode, after Kermit & Piggy sing "I Won't Dance" in At the Dance. W: That you should care for me. S: Well, there goes detente! S: Did you like that number? W: Speak up, my hearing aid's busted! W: I LIKE WHAT I HEARD! S: WHAT DID YOU HEAR? S: Is your hearing aid fixed? S: Then how do you know what I'm saying? S: I like the steel Drums! S: THE PIGS' STEEL DRUMS!!! W: I beleive it! They'll take anything that isn't bolted down! Fozzie: That's what we call a Disney Joke! S: No!! That's what we call a Dismal Joke!!! S: Have you ever been to a Witch Doctor? W: They're all witch! Ever been to a poor doctor? S: You did it! You saved the Pig and Frog! W: Well, it was too late to save the movie! S: Waldorf!! Wake up! Here come the bikinis! W: Oh boy! Let's syncronize our pace makers! W: The bear and the Snowman are great team. S: Yeah! The snowman's ice cold and the bear's not so hot! somebody think up some more! I don't want to be here all day! Sorry about that. I guess I got mixed up because George Burns and Dom DeLouise were on the same video. Statler: Do you believe in life after death? Waldorf: Every time I leave this theater. Waldorf: You know what kind of party Paul's having? come back can you give me my coat? Statler: Your hearing aid's busted again. Waldorf: Did you get us tickets? Statler: You bet! They're for a bus out of town! Statler: Can you sing tenor? time this week, so I'll try to come up with more. 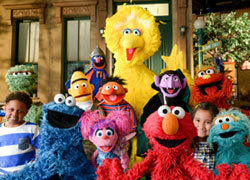 This joke was recycled from a live-action segment on "Sesame Street". In the segment, David is stranded on a desert island, rubs a bottle, and out comes a genie, as played by Maria. David asks for a boat to get off the island, and gets a coat, then a goat, before finally getting his boat (a TOY boat)! Statler: Boy, we really look like something from the rock age! Waldorf: No, we look more like something from the Stone Age! S & W: BOO BOO said the men in the theatre box, DON'T BOOGIE IN THE BARNYARD! Waldorf: Bravo! I loved it! I liked the goat! Statler: He would...the old goat! Waldorf: "Let's sneak out and grab a pizza." Statler: "That was your basic Latin number." Waldorf: "No, that was your basic Pig Latin number." S: That George Burns is a great singer! W: Well so am I, Statler! W: Sure! Hey, you wanna hear me sing? S: Only if you sing tenor. S: Ten or eleven miles away! HA HA HA HA HA! The life after death joke is saying that sitting through the show is death, and leaving the theater is life again. S: You're wrong. Nothing's less then that. Thanks David. I should have remembered the ones from the Elton John and Julie Andrews episodes considering they're on Timelife's first volume and I have watched that one more times than I've watched the rest of them. Lol. Here are some I made up for a few comicsin which Statler and Waldorf give their commentary. Just want to know what you think! Statler: What's worse than a movie about Michael Jordan without him actually being in it? Waldorf: How about a film about Michael Jordan WITH him in it? S: Hey bear! The only thing scarey around here is the fact you're still in comedy! W: Yeah! The only thing in this issue that won't come back from the dead is your act! S: Face it! In the field of entertainment, you don't stand a GHOST of a chance! Both: Dwoah! Ho ho ho!!! S: "Take a trip" you said. "See the world you said" you said. Now we're stuck on the front of this stupid ship. W: It could be worse. We could be stuck in the audience. W: Ah, it was terrible. S: Well, it was good. W: Ah, it was very bad. S: Well, it was average. W: Ah, it was in the middle there. S: Ah, it wasn't that great. W: I kind of liked it. W: Tell me, Statler, how do you like the album so far? I mean, just between you and me. S: I'd like to be off the record! W: Hey, this is a great way for Fozzie to do his material! S: Yeah, a moving target is harder to hit! S: He was doing okay until he fell off the stage. W: Wrong. He was doing okay until he came ON the stage! W: You know, on the show that wasn't funny. W: But on a record it doesn't even make sense. S: Yes, its over. How'd you like it? W: I don't know, I slept through the whole thing. S: Well, you didn't miss much. Norm: The Bobbsey Twins Go To The Brewery. Let's cut to the happy ending. What were the 2 S&W moments at MuppetFest?? I'm not sure about those Fozzie, cuz I didn't go !!! But here is one of my favorites. S: What do you think of the Movie? W: I've seen detergents that left a better film! I actually yelled that aloud in a movie theater once! Say, Statler, do you think "The Muppet Show" will be any better live? Well, at least it's only for one night. Ho-ho-ho!! (THEME SONG DRUM ROLL BEGINS) OH NO!!!!!! You know, the second half of this show reminds me of Aspen. Cause it's all downhill from here!